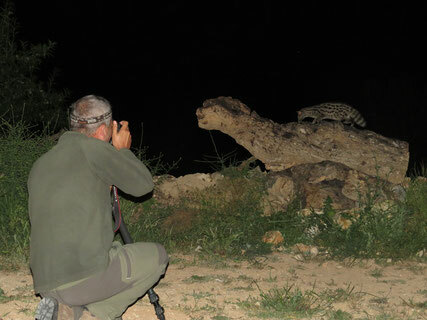 The location offers pristine conditions for observing, photographing and filming Genet cats (Genetta genetta). Over the last two years, several completely wild individuals have become habituated to humans and afford long periods of observation (minimum 10-30 minutes, but it is sometimes possible to enjoy their presence for and hour or two or even more) at short distances (usually 4-8 meters) and even in the presence of (small) groups of people. Our knowledge of their habits and movement (very regular) makes it possible to observe or photograph/film in different areas (on the ground, in trees and rocks) without disturbing the animals. Although it is necessary to lay out food for the animals in order to observe them properly, they do not alter their natural behaviour and still display hunting behaviour. It is therefore possible to observe or photograph and film them climbing trees, on branches or prowling the grass, searching for food in dead logs, on rocks etc. If you are lucky it will be possible to see hunting behaviour (mice or large invertebrates...), interactions with other individuals of the same species (they often encounter each other at our observation points) or even with other species (beech marten). 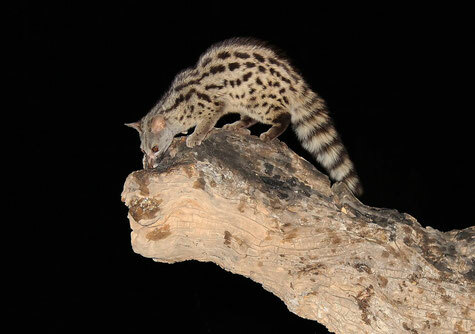 There are several different spots from which to photograph the Genet cats at close range (4-8 meters, less in certain conditions) and for filming (normally from between 4 to 10 meters), but we offer clients the chance to choose there own locations once they have become familiar with the area and we have been able to prepare it for them adequately. The animals are very trusting and by taking the necessary precautions (moving slowly, not making noise and arraying the flash guns properly...) you should be able to take several shots in the same location, affording superb photographs in different postures. It is even easier to film or observe the animals for long periods of time since there are no sudden noises, flashes or movements. The species are always observed or photographed at dusk or night. The exact times vary depending on the season but they generally start at dusk, nightfall or in full darkness. Which is why in winter animals generally appear from 6 pm onward and in summer it is necessary to wait until 10 pm. It is important to arrive at the location some time before the animals begin their activity in order to prepare and in particular for filming or photography in order to set up equipment and prepare the background. Approximate times shall be provided for each booking on a case by case basis, indicating when the photographer should arrive. For observations we have a soft spotlight which enables us to observe their behaviour. Photographers are required to bring their own lighting equipment (flashes, lights...). · Professional filming: Please enquire. Depends on the nature, duration and the product being filmed. · Photographer and 1 guest observer: €145. 2 or more guest observers (up to 4) will be charged €20 per person extra. · Two photographers: €200, up to 2 observers will be charged €20 per person extra. 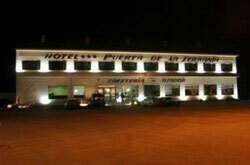 *60€ Additional cost / full day, for English speaking assistance, always require during hide sessions. Total price for 1, 2 or 3 photographers. It will be charge despite hide session results. 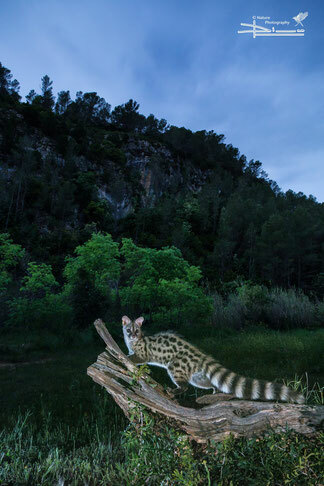 Guide for observation and/or photography/filming of Genet cats in a private forestry estate being used for organic agriculture and biodiversity management and conservation. Photography and lighting equipment (includes a spotlight for observation or photography). Clients are expected to arrange their own board, lodging and transport to the estate.